!fs is just the obvious lifting of fs. It would have been `green fs' if it had made it onto the slide. 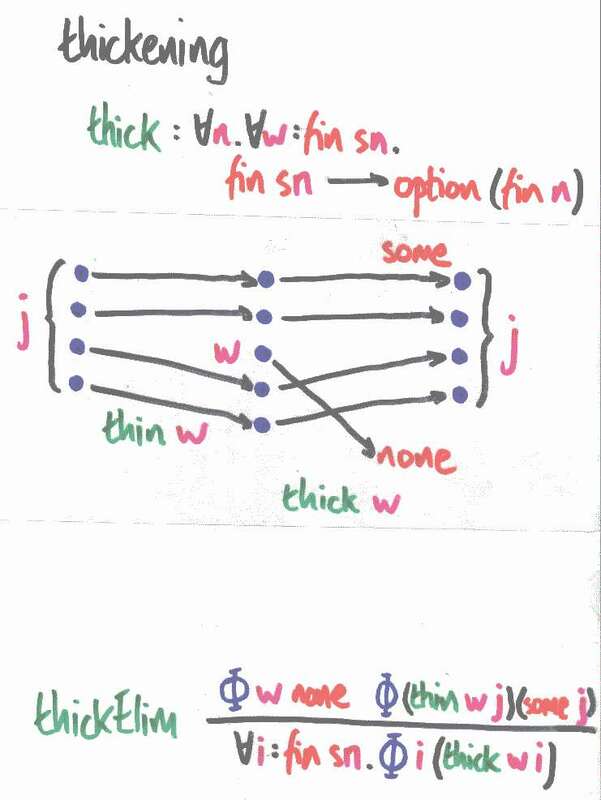 thick w is a partial inverse for thin w. It's good to think of (thin w j) as a `pattern' which matches the non-w elements of fin sn. Thickening codes up the corresponding case analysis. I got used to working with elimination rules when implementing pattern matching. They're very good for coding up the leverage a piece of information exerts on an arbitrary goal. We often think of specifications as inward-looking, telling us what program to write, but they should also be outward-looking, telling us how to reason about the program as a component of a larger one. Elimination rules do the latter job very well. I've been living in type theory so long, I'll never be content with a first-order specification logic again.